A sweet little Easter gift that says “I’m thinking of you” at Easter time, our Little Easter Gift is the perfect gift for the special child in your life. A super-soft little Jellycat Poppet bunny plus a cute board book, together in a white organza bag makes a beautiful Easter gift for little ones from birth up to the age of about three. Shipping to any Australian address is included. 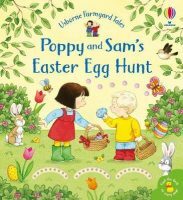 “Poppy and Sam’s Easter Egg Hunt” (RRP $14.99) is a sweet, new board book published by Usborne Books. 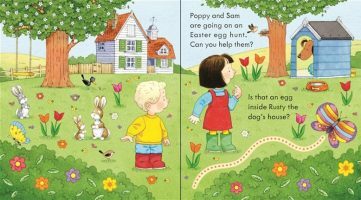 The book follows Poppy and Sam as they search for Easter eggs on Apple Tree Farm, meeting Daisy the cow, Rusty the pig and Clucky the hen along the way. Peep holes throughout the book allow children to search for the colourful eggs and finger-trails encourage them to trace the flight of a butterfly or bee. The Jellycat Poppet Caramel Bunny (RRP $19.95) is an incredibly soft little bunny friend, perfect for little hands to hold while listening to a story.